Lloyd Lee Lucht passed away on January 9 at the age of 75. He was born to Edith and William Carl Lucht, at the family farm in Molalla, on April 26, 1941. Lloyd was a very loving husband, father, and step-father. 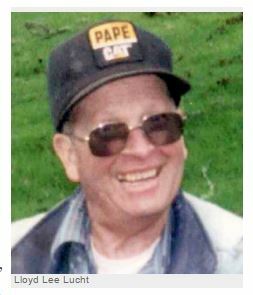 He drove log trucks for many years, and loved working on the farm, where he produced hay and filberts with his brother, Arnold. He was also an active member at The Moose Lodge in Molalla. He was preceded in death by his parents; son, Daniel; and brothers, Raymond Lucht and William Lucht, Jr. Survivors include his wife of 30 years, Katherine; sons, David and Dennis Lucht; step-children, Jennefer Williams and Delbert Wymore; brothers, Larry (Margurite) and ­Arnold (Patty) Lucht; sister-in-law, Ina; eight grand­children; seven great-grand­children and two on the way. A Celebration of Life will be held at The Molalla Moose Lodge on Jan. 28, at 2 p.m.